It was his darkest secret: Wolf, the Beast of Berlin, was more Labrador than fox when it came to ladies. "This is my only vice," he said, holding up the bloody handkerchief. The prince's smile was glorious. He liked the spirited American girl, and had decided to save her from embarrassment on a whim. "I met a damsel in distress, Oz. She needed the rooms more than we did. Come on, you always said I should be open to new experiences." Rona, on the other hand, was alone with a strange, wicked boy in her rooms, and he had just proposed they play a game where they take their clothes off. It was the farthest thing from being a lady, and she wuld never in a million years acquiesce to something so vulgar... But somehow, the way he proposed it, and the naughty smile on his face, made her think twice about saying no. "We are to be married," he said. "We are doing nothing wrong." And he kissed her hard on the mouth, and his tongue was down her throat. "You are mine," he said "Pretend it is our wedding night." ...When she was a child, she'd always wanted what was the princess's. Even at seventeen years old, it was a hard habit to break. It was what her mother had always tried to tell her: her life was not her own, and because of that it was glorious. I was almost instantly blown away by the plethora of views from interesting characters. This book is also part of a rising genre for me, so I got a lot more than expected. 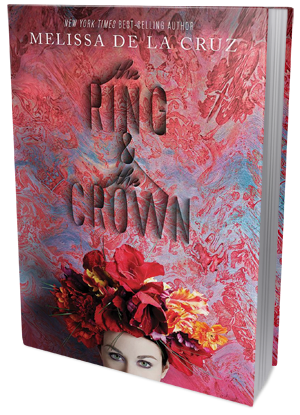 The Ring and The Crown is an alternative history, crossed with some fantasy. These two genre's on their own are appealing, but mixed together they created something uniquely wonderful. This book was easily devoured, taking up every spare minute I had until I turned the last page. It was different than anything else I have read by this author, but wonderfully so. I really enjoyed the plot and the pacing once I got into the book. Admittedly I believe that some people will have issues with so many points of view and until the second round I may have found myself a little lost, once you get it, it is wonderful. The characters voices become as clear as a bell and I feel the story was more rich because of it. Multiple points of view are not easy to pull off and this read has many. You follow four different girls, all leading very different lives, that are all intertwined by two men. Now saying this many will jump to love triangles and squares and many different shapes...but there isn't. Quite frankly the plot plays out with many little subplots, and has all of the deliciousness of love and scandal. Some things I assumed early on but it is the constant mystery and deception that easily and effectively kept me going. The girls were so vastly different and yet all seemed to suffer from the same problem, love. Be it marriage that they didn't want, the need for marriage, the longing for something that you couldn't have or love taken. In this sense every one of the girls basically wanted something that was just not meant to be theirs. I also had twisted feelings for two of them. I was never quite sure how to feel because they both had moments where I loved and loathed them. Ronan is the one I thought I felt for more than any but there were so many times that I found myself saddened by how shallow she was. Isabelle was the one that I never felt sorry for...until the end but by then she had strength and had grown into a character that has merit. I also feel that she could be trouble later if she wishes to be. Marie and Aelwyn, are opposites and yet they have something very in common. Each of these girls wishes they could lead the others life. Marie whom has lived her life with one sickness or another, is the princess and sole heir to a kingdom that believes she is not strong enough to rule without a man by her side. Aelwyn is powerful, and will lead her life serving the crown. Although Marie does not want t serve, she does wish she had the power of choice, something she will never have, and Aelwyn wishes for the ability to have anything she wants. The majority of the plot is spent leading up to the great destiny that these two have but it does not reveal itself (spectacularly) until the very end. Wolf and Leo are so beyond different, that it is crazy. There are more guys than these two but these ones are the main focus. They are the epitome of don't judge a book by its cover. Brothers by blood and by upbringing and yet they couldn't be more different. Surprisingly though they did have some sort of a bond, brotherly love. However, this being said Leo is a slime ball and Wolf is accused of being one. Wolf is one of those characters that I think everyone is going to like. Full of life and his own opinions but with a strong sense of right and wrong, it's not hard to see why. There is no happily ever after with The Ring and The Crown and I honestly can't say that this disappointed me. Books now are filled to the brim with the lust, the lost, the torture and then the perfect ending. The ending in this one was more bittersweet than anything and I appreciated the author taking it to where it was right, where things aren't happy, but the just are. If you are looking for something that will be all romance and the perfect ending, this book is quite simply not for you. However, if you are like me and can appreciate the bittersweet honesty of it all and can sink your teeth into multiple points of view, I really believe that you will enjoy this read!